This month's theme for What's your favourite event series is Cook book/Recipe books. You must be aware of one of our blogs which we have dedicated mainly to "Help on blogging" for new bloggers and "Reviews on cook books" for giving a quick view on different cook books for those intending to purchase some. This month I invite you all to send me your reviews on the cook books you own..
# No restrictions this month on the number of entries. # The complete review with the photograph of the book would be published under the "Cookbook Review" label of the blog. # Please add a link to the "Cookbook Review" label as well as event announcement in your post. Although reading all these might make it appear complicated, it would be exactly a five minute job of taking a picture, writing down a few words about the books and providing a link. Hope you all come up with reviews for all the cookbooks you have. Waiting to see the books that inspire you in cooking up delicious food for your family.. Recipe source: Rekha from Plantain leaf with changes to suit our taste buds. For green chutney, grind coriander leaves, green chillies, salt, ginger paste and mint leaves. Cut the corners of the bread slices and spread jam on one slice and green chutney on another. Keep the third slice plain. Place bread slices above the other and cut it diagonally. Make a soft dough of ragi, all purpose flour,salt and water. Roll into medium thickness chapatis and cut them into small squares or diamond shapes. Deep fry them in hot oil till crisp and done..Dont let it turn black, else it will be bitter. Cool and store in an airtight container. Easy snack for tea time. Dry roast the masala ingredients except cumin seeds. Cool and grind to coarse powder. This can be stored in an air-tight container for future use. Add salt, asafoetida and 2 tsp masala powder to the tamarind extract. Add 2 cups of water and allow it to boil well. Temper with mustard seeds and curry leaves. Can be served with rice or had as it is as a soup. A quick recipe that is very beneficial to health during illness because of the medicinal properties of cumin seeds and pepper. Sending it over to Trupti for the Comfort food for illness event. Mix all the ingredients except cheese and bread slices. Remove corners of bread slices and cut diagonally into half. Spread it on the bread slices and press well. Add grated cheese and grill for a minute till cheese melts. Heat ghee and roast the ragi flour for 3-4 minutes. Add the all purpose flour and roast for another 2 minutes. Add 3 cups of hot water to it and mix well without lumps. Add sugar, cardamom powder and keep stirring till it becomes a big lump. Add the roasted nuts and raisins and mix well. Transfer to greased plate. Cool and cut into pieces. Heat oil and add mustard seeds, dals and curry leaves. When it splutters, add it to the rest of the ingredients and mix well. Keep covered for 15 minutes. Mix well and pour into idli plates. Steam for 7-8 minutes. Pierce a knife and check if it comes out clean. Cool for a minute and serve with chutney or sambar. Mix all the ingredients well and sprinkle some water to make it a dough. Make small balls of it and flatten them by patting with hands. Spread little oil in hands if required to prevent it from sticking. Deep fry the vadas in hot oil till golden brown and crisp. Serve immediately with chutney and sambar. Heat 2 tbsp ghee and roast the gram flour till nice aroma comes. Mix the milk with 1 cup water and slowly add it to the flour and keep stirring. Add sugar and cardamom powder and keep stirring well. Add the rest of the ghee and mix until it starts leaving the sides and becomes a lump. Transfer to a greased plate. Heat oil and add mustard seeds, bengalgram dal and blackgram dal. When it splutters add curry leaves, asafoetida and cut okra. Keep frying on low flame till okra is cooked. Add tamarind extract, turmeric powder, salt, jaggery, grated coconut and cook for 3-4 minutes till raw smell of tamarind goes off. Finally add the masala powder and water as required and cook for 2-3 minutes. We had this dosa at a mall recently and the filling was quite interesting and tangy. Fry the paneer pieces slightly and keep aside. Heat 1 tsp oil, add onions and fry for a few minutes. Add a bit of salt, soya sauce and red chilli sauce. Finally add the paneer pieces and mix well. Make thin and crispy dosas and place the paneer filling inside. Roll and cut lengthwise into three or four pieces. Serve immediately with chutney and sambars. how to make crispy dosa, paneer stuffed dosa, tangy stuffing for dosa, south indian dosa variety with a twist. Dip the bread slices for a second in water and squeeze out all the water. Add other ingredients except oil and mix well. Make small balls and flatten them. Roll in either rava/sooji or bread crumbs. It can either be deep fried in hot oil or cooked on tava with very little oil till cooked on both sides. Make a soft dough of wheat flour, salt and water and keep covered for 1/2 hour. Drain out the water from the dal and grind coarsely. Add salt, garam masala powder, green chillies and coriander leaves. Mix well and make small balls of it. Make medium balls of the dough and roll out into thick poori. Place the stuffing in the center and cover with dough from all sides. Dust with flour and roll out again into thick parathas. Cook on hot tava with oil/ghee till brown spots appear on both sides. Make a soft dough of all purpose flour, salt and water. Keep aside for 10 minutes. Roll out into small puris and fry them till crisp. Dip them immediately in warm water for a few seconds. Heat the milk and add sugar. Add cardamom powder and let it keep boiling for 10-15 minutes on low heat. Add the fried pooris to the milk and garnish with nuts and raisins. Usha of Veg Inspirations sent in this recipe for the WYF:Cuisine event..I didnt make any changes to the ingredients and we enjoyed it with rice. Heat oil, add mustard seeds and blackgram dal. When it splutters add curry leaves and asafoetida. Add the cooked redgram dal, turmeric, cooked cabbage and salt. Cook for 2 minutes and add the masala paste. Add water as required and cook for 5-10 minutes till slightly thick. Read why it is advisable to invest early..
Make a soft dough of the ingredients and keep covered for 1/2 hour. Make small balls and roll out into a thin chapati.Stretch it to make it as thin as possible. Cook on an inverted wok till brown spots appear on both sides and fold it like a handkerchief. Cook the bengalgram dal in little water till soft. Dont overcook it till mushy. Drain out the excess water. Add the rest of the ingredients to it and mix well. Another crispy version of arbi fry with less oil. Pressure cook the arbi and remove the skin. Cut into small rounds. Heat oil and add mustard seeds and dal. When it splutters, add turmeric powder and poha powder. Add arbi, red chilli powder and salt. Mix well and keep roasting on low flame till crispy. Heat oil, add mustard seeds, cumin seeds, bengalgram dal and blackgram dal. When it splutters, add cloves, cinnamon and bayleaf. Then add ginger paste, turmeric powder and cooked black eyed pea. Add salt and garam masala powder. Mix well and add the cooked rice. Finally garnish with coriander leaves. I have a new blog (http://simpleindianfood-blogroll.blogspot.com/2009/05/how-to-create-blog.html) that would feature my blogroll and awards. Two other important sections in this blog would be "Cookbook reviews" and "Help on Blogging". Help on blogging segment would feature notes for new bloggers who need assistance. 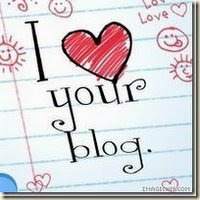 The first step in this direction is "Creating a blog" . Now for the second and most interesting section about Cookbook reviews. Inviting you all to be a part of this blog by sending me reviews of the cookbooks you have so that we can have one place that would feature all the cookbooks. It would help others to choose the books that would suit their needs and style of cooking. Please mail me the reviews and a picture of the cookbook front cover at easycrafts@gmail.com. I will soon come up with a logo that we can have in our blog sidebar which will link to the reviews of cookbooks. Hoping to get a good response from you all in this small effort of making a collection of good cookbooks. My first cookbook review is LIFCO's How to Cook . My recent addition to cookery books is one on Udipi cuisine and this is the first recipe I tried..
Soak the rice for half and hour and drain out the water. Grind it along with coconut and salt to a thin paste. Heat the jaggery with little water and once it melts completely, add the paste to it and keep stirring to get a big lump. Add cardamom powder and transfer to a greased plate. Cut into pieces once cool. Heat oil and add cumin seeds. When it starts spluttering, add the onions and fry for a minute. Add the chopped tomatoes to it and cook till it turns mushy. Add turmeric powder and crumbled paneer. Add red chilli powder and salt and mix well. Pour a ladle of dosa batter on the tava and spread it. Pour a little bit of oil in the sides. When cooked, place a little paneer filling in the center and fold it. Mix corn, cheese, pepper and salt as per taste. (Cheese already has salt, so take that into account). Dip the bread slices in water and remove immediately. Squeeze all the water and add a bit of salt, red chilli powder, garam masala powder and chaat masala to it. Mix well. Make balls of it. Flatten them and place little corn cheese filling in the center and cover well to make a ball. Shape them into rounds or heart shapes. Roll it lightly with rava or with bread crumbs. Repeat for the rest. It can be either deep fried in hot oil or cooked on tava with little oil till crispy on both sides. Serve hot with sauce. Quick cheese corn cutlet ready in minutes. This is my first entry to WYF: Quick Meal event. Mix cucumber, salt, coconut and lemon juice well. Temper with mustard seeds and red chillies. Cut the kovakaai into thin rounds or into thin pieces lengthwise. Heat oil, add mustard seeds, bengalgram dal and blackgram dal. When it splutters, add the turmeric powder and then the cut vegetables. Cook on low heat till it becomes soft. Sprinkle some water in between for faster cooking with less oil. Finally add salt and red chilli powder and mix well. Cut the potatoes into cubes and fry them in hot oil till crispy. Sprinkle the masala powders, salt, sev and chutneys over it. 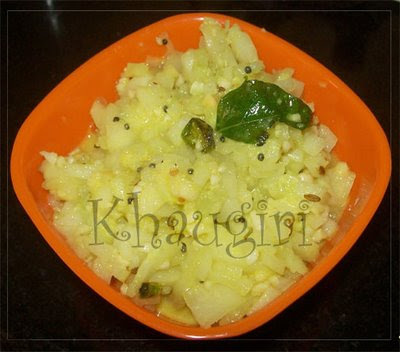 Garnish with chopped onions and coriander leaves and serve immediately. Sending it over to Pallavi's Sunday snacks-Chats event. Roast the coriander seeds, bengalgram dal and fenugreek seeds in a drop of oil. Then roast the red chillies seperately. Cool and grind all the masala ingredients together. Heat 1 tsp oil, add mustard seeds. When it splutters add curry leaves and then the onions. Fry for a minute and add tomatoes. When it becomes mushy, add the tamarind extract, turmeric powder, salt, red chilli powder and jaggery. Cook for 3-4 minutes and add the masala paste. Then add the cooked dals and more water as required. Cook for five minutes till the sambar is of the desired consistency and garnish with coriander leaves. Tastes great with rice or South Indian breakfasts like idli, dosa, upma and pongal. Roast the bread slices in 1 tbsp ghee till golden brown. Cut into small pieces..It is optional to remove the corners. Heat the milk and add the bread pieces to it. Keep stirring till the bread absorbs the milk and becomes soft. Add sugar, cardamom powder and mix well till sugar melts. Add ghee and stir for a minute. The halwa would be the best if sweet bread is used. Other variations would be adding some fruits or some cocoa powder and choco chips. how to make bread halwa, quick halwa recipe, using leftover bread slices, sweet desert with bread. Recipe source: Renuka from Fusion blog. Fry the chopped onions and tomato in a bit of oil. 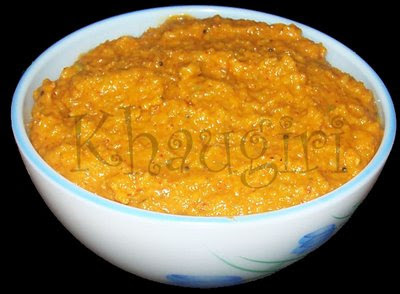 Cool and grind along with coconut, salt, coriander leaves, asafoetida and tamarind paste. Temper with mustard seeds and blackgram dal. how to make kadamba chutney, mixed chutney variety recipe, chutney with leftovers, side dish for idli dosa and south indian breakfast. Sprinkle a few drops of water on the poha and keep mixing it with hands to make it soft. Add grated coconut, jaggery and cardamom powder and mix well. Vellam aval ready to serve as a quick sweet. Recipe source: Ramya from Ramya cooks. Soak the rice, dal and sago seperately for 4-5 hours. Grind the ingredients to get a smooth batter. Ferment for 6-8 hours. Pour the batter in idli plates and steam for 7-10 minutes. Pierce a fork in the idli and check if it comes out clear and non sticky. Soak the dal in sufficient water for atleast 1 hour. Drain out all the water and add salt, lemon juice, green chillies, grated coconut and coriander leaves to it. Mix well.